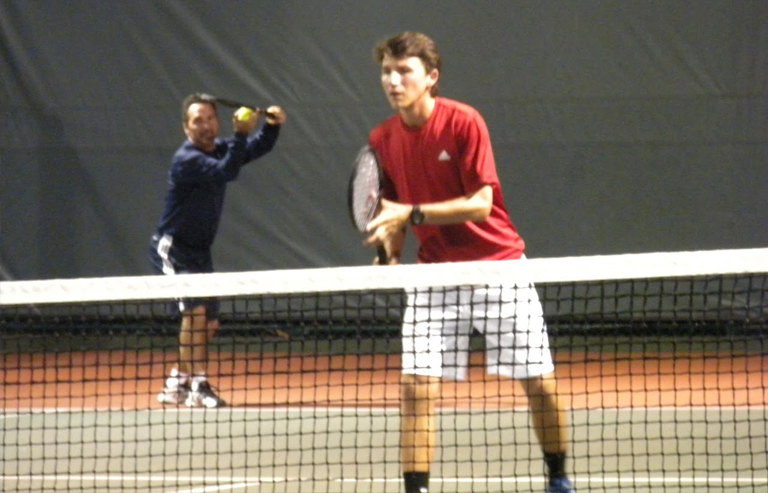 Many adult competitive players struggle to hold serve consistently in their matches. When they watch the pros play they think that if they had a bigger, harder serve that their problems would be solved. The bad news is that they will never serve as hard as the pros. The good news is that they don't need to. All of the things you need to be successful in holding serve are things that all players can develop with the proper mindset and the right kind of practice. This summer, my adult groups have been working on what I call the Three C's of serving. If you work on and master these three things, you will gain a vast amount of confidence in your service game and begin to expect to hold serve all the time in doubles. At The Previdi System, we want you to be excited about your service game. It's the only game that you, as an individual, can hang your hat on and call your own but don't forget that you need your partner to make that happen.Here are the Three C's. * Commitment- In order to win your serve on a regular basis, you must be committed to staying with your game plan even when things aren't going your way. At The Previdi System, we want you to serve and volley all the time on all your serves. That takes a lot of practice as well as a lot of physical and mental stamina but it will give you control of the points on your serve. You will make adjustments with your serve ( placement, speed) as you see what's working but you will not abandon the things you've practiced regardless of the struggle you may have. Your service game defines you as a player and you don't want your partner or your opponents to think you're weak and can be broken down. Once you commit you will get better and better at serve and volley because you have no choice and there's no turning back. * Consistency- Anyone who follows The Previdi System knows that accuracy and consistency are the hallmarks of a true Previdi System player. When we talk about consistency in the service game we mean being able to consistently get your serve where you want it to go and where your partner has signaled you to hit it. Again, a commitment to placing the serve will immediately make you a better server because your expectations are much higher. Learning to use spin and change speeds on the serve is something all players can learn with relative ease and is critical to making your opponent miss returns and get some free points for your team. As important as consistent serving is consistent volleying. When the server hits a midcourt volley they have one goal; make every volley that comes your way. Don't have the mindset of "putting away" a first volley. If you make the first volley and hit it back to the receiver they now have to hit a second shot right after the return. The difference is that they don't know what or where they will be hitting. You will be amazed at how many second shots don't come back or come back weakly when you make your first volley. The server's partner must be consistent as well. They need to know where they should be hitting the ball if it comes to them and be ready to execute a strong volley without being overly aggressive and blowing an easy one. It's always important to remember the three things that can happen when we serve and how we handle them. 1.) We hit a serve and the receiver misses the return. (This is obviously our favorite scenario and we do what we can to make that happen with our serving plan). 2.) The receiver hits the ball where our partner can get it and our partner hits an aggressive volley or overhead. ( Second favorite). 3.) The receiver hits the return to the serve who manages the situation by making every volley and keeping the pressure on the receiver to make another ball. We think of this as managing the situation rather than trying to win the point outright. We know from many years of playing experience that you will win matches against all kinds of players if you don't give away points by missing volleys. Some volleys will be more offensive and some volleys will be neutralizing but we make them all! * Connection- This is the C that most doubles players struggle with and it's the main reason they don't hold serve. If you and your partner are not connecting and playing together then the receiving team is playing two against one. In The Previdi System, the server's partner plays the part of the catcher on a baseball team; they call the serve for their partner who can "shake them off" like a pitcher does. We prefer hand signals but you can do whatever works for you. This keeps the server's partner engaged in the game. They need to observe tendencies and weaknesses in the opponents returns. They need to position themselves and the serve so that our team is only allowing returns we can handle. If the net player can make the receiver take them into account when they return then we have added another layer to our game. We want the receiver to be indecisive and to make bad decisions based on what they see or what they think they see. There is nothing more satisfying than holding serve and realizing that we did it together. If you think the only way you can help your partner win their serve is by poaching then you're missing a huge opportunity to be a great partner and have everyone want to play with you. The server's partner helps to guide them home. Again, like a catcher you keep them calm, keep them believing and do whatever it takes to help your partner ( and team) be successful. In closing, you should love serving and look forward to it. Sometimes I secretly hope we don't win the set on the opponents serve so I can serve it out. I just want to stress that being great at holding serve isn't about the big things, it's about the little things. Just remember the Three C's and you'll be holding serve too!